Conventional X-ray imaging is based on the attenuation of X-rays propagating through the object of interest. Hereby one exploits the imaginary part of the complex refractive index of the object, while the real part is completely omitted. The real part of the refractive index, however, leads to a phase shift (usually a phase advance in the X-ray regime) between a wavefront passing an object and an undisturbed wavefront. For the condition of (spatially) coherent X-ray wavefronts one is able to determine this phase shift, although this has to be done via indirect methods. 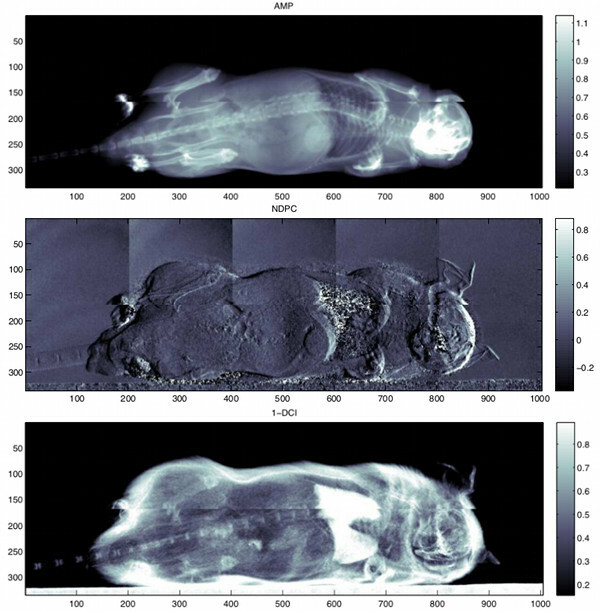 Figure 1: Recording of a mouse in all three image contrast modalities obtained within one grating interferometer measurement process: attenuation contrast (top); differential phase (middle) and dark-field contrast (bottom). The additional information content in the images additively available to attenuation contrast is easy to recognize. Our approach to obtain the phase shift of an object is the use of a Talbot-Lau grating interferometer. This device is a powerful experimental tool to gain phase, attenuation and dark-field information within one imaging process. Three line gratings get exploited within a compact interferometer setup, which is illuminated by a conventional high-power X-ray tube source as it is used in standard medical imaging devices. Different kinds of X-ray detectors can get employed in our laboratory setup for image acquisition: commercially available flatpanel detectors as well as novel photon-counting hybrid detector systems. 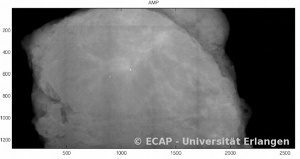 The Timepix detector with its spectroscopic information herein is a helpful device for our research in order to understand the physics of the system and improve signal in phase contrast imaging. In order to achieve most reliable results our research on grating based interferometry is based both on experiments as well as on simulations. The simulation framework has been developed in house and is based on scalar diffraction theory and the Monte-Carlo simulation framework RoSi. The framework is tested against different measurements and performs as expected for X-ray Talbot-Lau interferometry. 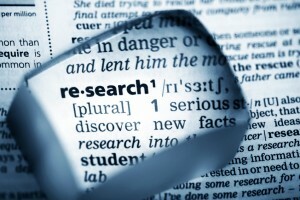 Possible applications include optimization of the setup and analytical questions on the method. It has also been used to provide realistic input for the evaluation of image reconstruction algorithms. Figure 2: Attenuation (top) and dark-field (bottom) images of a breast mastectomy specimen containing a tumor in the upper region. The dark-field provides supplementary information in the reconstructed signal, that is due to scattering in the event of clusters of superfine microcalcifications (see T. Michel et al., 2013, Phys. Med. Biol. 58, 2713). The main task of our group is to characterize and to optimize the grating interferometer and to find applications for X-ray phase contrast imaging. Phase signal depends on several parameters, which need to be examined, such as setup design, interferometer visibility as a function of energy, X-ray tube spectrum, object properties or detector response. The potential image information gain in medical imaging as well as in non-destructive testing is under investigation. Phase contrast, and dark-field contrast in particular, provides additional image information especially for matter that features fibrousness or granularity at the scale of voxel sizes or even below. This can get examined when having a look to the three different signal contrasts when imaging a mouse (see figure 1: attenuation contrast – top; differential phase – middle; dark-field contrast – bottom). This issue can get exploited in different fields of medical diagnosis. 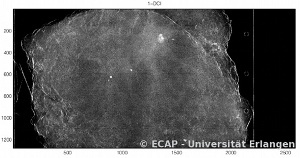 An emphasis in our group thereby is put to breast cancer detection in enhanced mammography studies: in collaboration with the University hospital Erlangen the impact of clusters of superfine microcalcifications, as present in breast tumors, on the dark-field signal is considered. First results show great potential to improved early cancer diagnosis and better detectability of breast cancer through the exploitation of the phase contrast signal in addition to attenuation signal (See comparison of attenuation and dark-field contrast in figure 2: attenuation – top; dark-field – bottom). The latter provides supplementary information regarding calcifications within the tumor region). Furthermore the dark-field contrast can be evaluated when studying samples with highly ordered structures, as the signal is depending on the orientation with respect to the grating interferometer setup. Those several benefits allow Interferometric imaging assume a powerful new tool in the area of X-ray imaging.